Joseph Noel Paton was the leading Scottish artist of the Victorian period to specialise in imaginative figure subjects, and notably fairies. In producing such masterpieces as The Quarrel of Oberon and Titania, he capitalised on his mimetic skills in order to represent the supernatural with great conviction. Joseph Noel Paton was born in Dunfermline, Fife, on 13 December 1821, the second of three children of a damask designer and manufacturer. His father’s interests as an antiquarian and collector provided early inspiration. (The collection, inherited by Paton, is now in the National Museum of Scotland, Edinburgh.) From his earliest years, his reading fired his imagination, and he made drawings based on tales of Celtic romance and legend, in addition to episodes from the Bible and ancient history. He developed talents for both literature and art, and would become a poet and critic as well as a painter and sculptor. On completing his education at Dunfermline School and Dunfermline Art Academy, Paton spent three years in his father’s profession, becoming director of design at Brown, Sharp & Co’s sewn-muslin factory at Paisley, Strathclyde. Then, in 1842, he left Scotland for London where, in the following year, he entered the Royal Academy Schools. Though he did not take up a studentship, his time at the Schools proved important to his artistic development, for he met and befriended a younger, precocious student, John Everett Millais. Paton’s aptitude for literary subjects enabled him to work as both illustrator and painter. He contributed to Samuel Carter Hall’s The Book of British Ballads (1842/1844) and Mrs Hall’s Midsummer Eve: A Fairy Tale of Love (1847), two landmarks in the construction of the Victorian imagination. He also entered the competitions for the decoration of the rebuilt Houses of Parliament, a project on which the health of British history painting seemed so strongly to depend. He established his reputation in England with his two prizewinning entries, The Spirit of Religion (1845) and especially The Reconciliation of Oberon and Titania (1847). 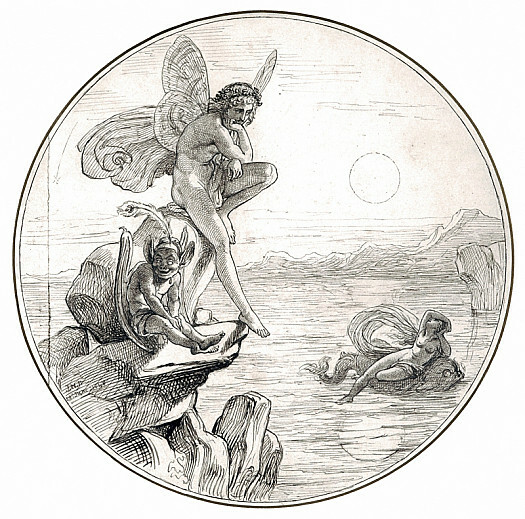 He had already exhibited his first, small version of its pendant, The Quarrel of Oberon and Titania, in Edinburgh in 1846, as his diploma work on becoming an associate of the Royal Scottish Academy. Paton was invited by Millais to join the newly founded Pre-Raphaelite Brotherhood. Though sympathetic with its ideals, he declined, for he disliked London and preferred to return to Scotland. As a result, he practised and promoted its principles in the Scottish capital, recording the natural world in almost uncanny detail, and capitalising on his mimetic skills in order to convincingly represent the supernatural. This he demonstrated triumphantly with the large version of The Quarrel of Oberon and Titania, judged to be the painting of the exhibition when shown, in 1850, at the Royal Scottish Academy. He was elected a full academician in the same year. Paton’s approach to landscape painting was influenced not only by the example of the Pre-Raphaelites but by the writings of their champion John Ruskin. Paton met Ruskin through Millais and, in 1853, attended the lectures that he gave in Edinburgh on Architecture and Painting. Soon after, he went on painting trips with his brother, the artist Waller Hugh Paton, to the Isle of Arran (1854 and 1855), possibly to Loch Lomond (1858), and later to the Continent (1861 and 1868). 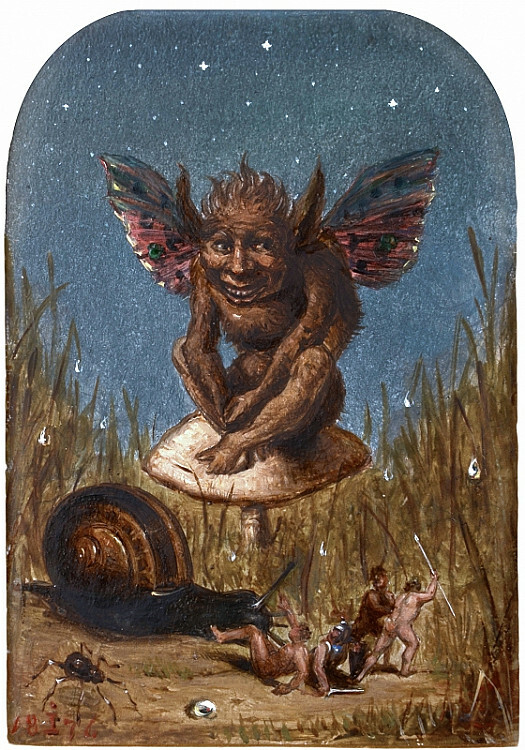 By the late 1850s, Paton was as well known and admired in England as in Scotland, through his exhibits at the Royal Academy (1856-83) and his illustrations to Charles Kingsley’s The Water Babies (1863). He was appointed Queen’s Limner for Scotland in 1866, and knighted a year later. His work as an original imaginative painter culminated in 1867, with the completion of The Fairy Raid and its exhibition at the Royal Academy. Five years later, he declined the invitation of Lewis Carroll to illustrate Through the Looking-Glass and What Alice Found There, the author’s second great work of fantasy, stating that John Tenniel remained the ideal artist for the job. Instead, he devoted his remaining time to painting religious subjects in an academic manner comparable to that of his compatriot William Dyce. He died at his home in Edinburgh on 26 December 1901. Of the 11 children from his marriage to Margaret Gourlay (died 1900), his sons Frederick Noel Paton and Ronald Noel Paton also became artists. His work is represented in the collections of the British Museum; and the Art Gallery and Museum, Kelvingrove (Glasgow) and the National Gallery of Scotland (Edinburgh).